Banana Bread becomes a necessity around here once in a while when the bananas don’t get eaten as quickly as predicted in the grocery store. It’s a classic supply and demand situation. The supply quickly exceeds the demand when schedules change, the supply of other fruit surges or whims of resident banana consumers shift with the Nebraska “breezes”. That’s anything less than 55 miles per hour – which is considered a blizzard force only if accompanied by snow. But that’s another story. . . . 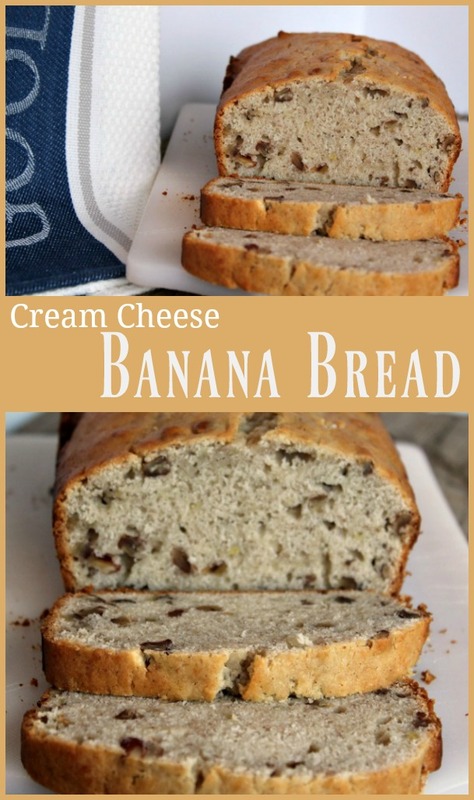 The idea of Cream Cheese and Bananas kept tickling my fancy – maybe you could say it was blowing in the wind. No, no – must concentrate. Anyway, I found a couple of recipes and mooshed them together, then tweaked the results. I baked them last night and the aroma that gently swept through the house was heavenly! When we tasted the results this morning – aah! 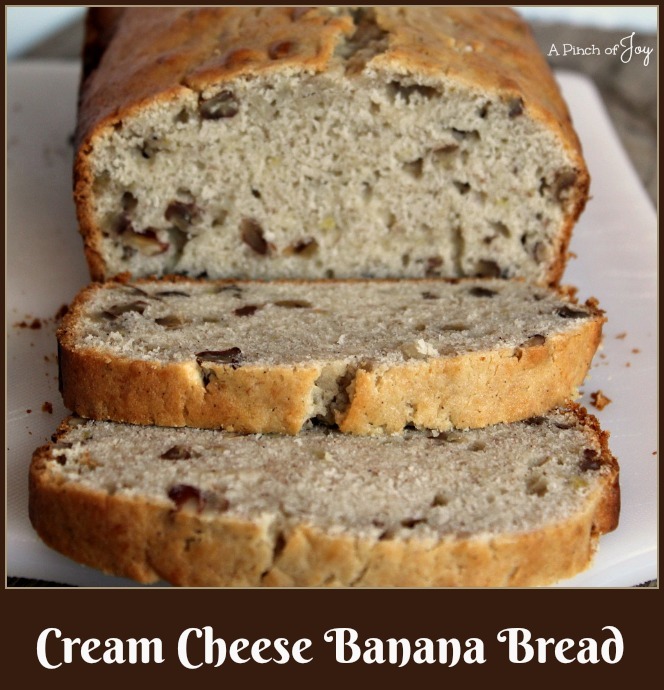 The cream cheese gives the bread a dense texture unlike conventional banana bread. But this mixture has something in common with other quick breads, including banana bread. When you add the dry ingredients don’t overstir, as it will make the finished product tough. I used chopped pecans which makes it easy to evenly distribute the nuts in the batter and also make it easier to slice the finished bread. Chopped walnuts would probably also be good! 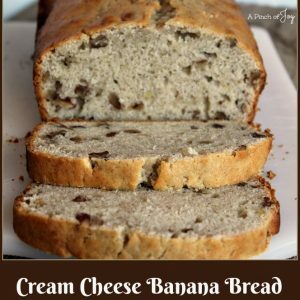 I used a touch of allspice – just enough to enhance the nutty and banana flavor but not enough to really taste the spice. I froze one loaf today so a bonus treat for another day! Densely textured, lightly spiced,nutty with the distinct flavor of delicious banana. Preheat oven to 350. Grease and flour two 8 by 4 inch loaf pans. in large mixing bowl beat butter and cream cheese until well mixed and creamy. Gradually add sugar,beating until light and fluffy. Add eggs one at a time, beating after each one. Mash bananas with a fork in a two cup measure and add to cream cheese mixture. Add vanilla. in a medium bowl combine dry ingredients. Gradually add flour mixture to the to the cream cheese mixture while beating at low speed until ingredients are just combined. Stir in pecans by hand. Bake at 350 for 50 to 60 minutes or until a toothpick inserted in the center comes out clean and edges of bread have pulled away from the side of the pan slightly. Cool bread in pan on wire rack for about 10 minutes. Remove from pan. Cool for 2-3 hours before slicing.